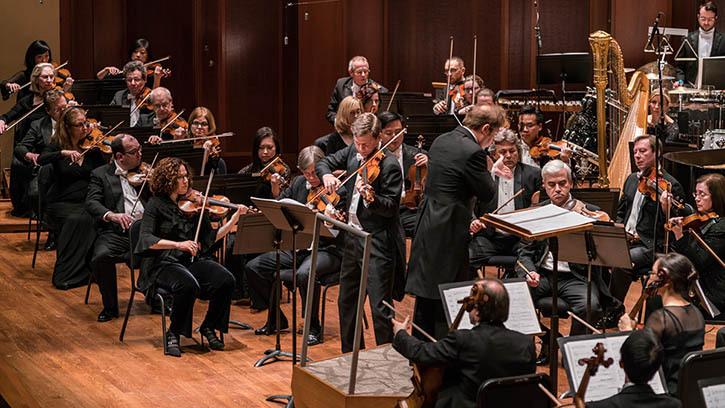 The Recording Academy announced today that Ludovic Morlot, Thomas Dausgaard and the Seattle Symphony received three nominations in the classical category for the 2019 Grammy Awards. According to the Los Angeles Times, the Seattle Symphony is leading all orchestras this season. Music Director Ludovic Morlot and the Seattle Symphony are nominated in the categories of Best Classical Instrumental Solo and Best Contemporary Classical Composition for their work on violinist James Ehnes’ recording of Aaron Jay Kernis’ Violin Concerto, which was commissioned and premiered by the Seattle Symphony. Music Director Designate Thomas Dausgaard and the Seattle Symphony are nominated in the Best Orchestral Performance category for the live recording of Nielsen Symphonies Nos. 3 & 4. Please join us in congratulating Ludovic Morlot, Thomas Dausgaard, violinist James Ehnes, composer Aaron Jay Kernis, Recording Engineer Dmitriy Lipay and the musicians of the Seattle Symphony! You can listen to the recordings below. The commission by Aaron Jay Kernis was generously supported by Patricia Tall-Takacs and Gary Takacs. James Ehnes’ performances were generously underwritten by Dana and Ned Laird through the Seattle Symphony’s Guest Artists Circle.